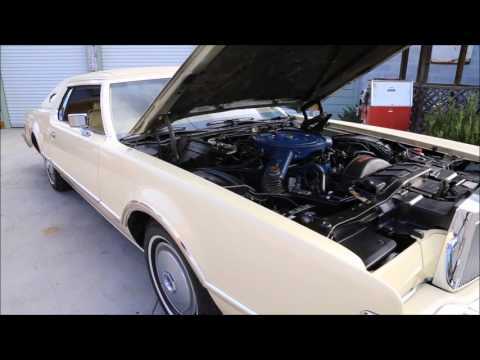 Up for sale we have a 1976 Lincoln Continental. This is a local car that retains a lot of the factory paint, interior, and drive train. When you walk around it all you can say is wow. Down the sides are straight as an arrow with great lines. The side trim is in good condition with great fit. All the chrome looks good as does the stainless. As for the glass, it's factory with the side glass being tinted. The body is covered in the factory 6PFV color scheme featuring the Cream Paint and Cream Normande Vinyl Top. You can tell this car has been garage kept most of its life as the paint and vinyl top are in great condition. To finish off the look it's siting on the factory style rims with the full-size caps and good set of white wall tires. On the inside it's done in the tan leather with a split bench seat. Both sides of the seat are power and this Continental also has the Power Windows with the overhead map light and remote mirrors. The carpet looks great as does the rest of the inside. Looking at the dash it has an AM FM Radio, Tilt Wheel, and Cruise control. In the trunk, it has the correct spare and jack as well as the factory mat. Under the hood it's powered by a 460 V8 that looks as it did in '76. It comes with Power Steering and Four Wheel Power Disc Brakes. The A/C all looks factory. The Power Brakes are Hydro Boost which is good for a car of this size. When you look under this Continental the pans look awesome and appear to have never been undercoated. The frame rails all look good as does the fuel tank and lines.